Many animals are thought to deter eavesdroppers by making their signals revealing the location or quality of resources less conspicuous to outsiders. In essence, they’ve evolved “whispers” in their signals to counter eavesdropping. But some species of bees in Brazil do the exact opposite. ”Shouts” in their food-recruitment signals warn would-be competitors that their prime source of food will be fiercely defended if they show up to the site. It’s a communication strategy that’s bold and risky, yet remarkably successful in warding off competitors, according to a paper published in the July 7 issue of the journal Current Biology. Lichtenberg said her discovery of this counterintuitive method of communication by bees suggests that eavesdroppers can alter the evolution of animal signals in ways that were previously not thought possible. In the case of bees and other pollinators, he said, “a network of signals and cues shapes pollination, informing animals about where and when food is available. Researchers have in general thought about eavesdropping as a force that makes signals less conspicuous, leading to the evolution of ‘whispers’ to counter spying. 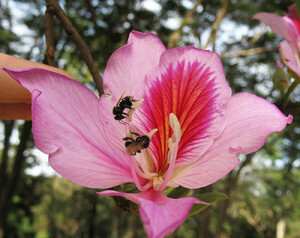 Lichtenberg’s study focused on stingless bees—including two from the genus Trigona that recruit nestmates to food sources with chemically distinct pheromones—that compete with one another for similar food sources. Trigona hyalinata spies that detect food sources marked by Trigona spinipes foragers will often displace T. spinipes from desirable sites in the wild if they can recruit sufficient nestmates. But Lichtenberg found in a controlled field study that the eavesdropping species will avoid desirable sources of food that have been visited frequently by T. spinipes (communicated by the larger number of pheromone markings at the site) to avoid being attacked. However, T. hyalinata foragers are attracted to food sources with fewer T. spinipes foragers. The eavesdroppers could take over the highly visited sites by recruiting more of their nestmates or battling with T. spinipes bees, which show high levels of aggression toward intruders, but the risks and energy costs to the eavesdroppers apparently aren’t worth the trouble. The researchers supported this hypothesis by modeling eavesdropping bees’ decision-making, using a type of model from economics. They ran the model for T. hyalinata eavesdropping on T. spinipes, T. spinipes on T. hyalinata, and the non-aggressive Melipona rufiventris on T. spinipes. In all three cases, they found that the model results matched eavesdropping behavior measured in this study and in previous work by Lichtenberg, Nieh and colleagues. “Our study is one of the first to investigate what drives the behavior of eavesdroppers collecting information from competitors within the same trophic level, which use the same food resources as the eavesdropper,” she said. The study not only provides information about the evolution of different strategies of animal communication, but suggests how these strategies can affect the ecology of plant communities. Other authors of the paper were Joshua Graff Zivin of UC San Diego’s School of International Relations and Pacific Studies and Michael Hrncir of Brazil’s Universidade Federal Rural do Semi-Árido, where the study was conducted. Funding for the study was provided by grants from the National Science Foundation and the Animal Behavior Society.